Today’s post was written jointly by Arielle Nissenblatt and Lonnie Kleinman – two young Jewish professionals who also happen to be roommates. A few months ago, we saw a posting for a local environmental event. So we put on some sustainably manufactured clothes, grabbed our Nalgene water bottles, and headed to our neighborhood community garden. Unsure of what to expect, we wound up participating in a two hour drum circle while different people took turns reading off a list of “10,000 ways to save the earth” into a microphone. Although our hands were sore and our ear drums were tired, we walked away energized and excited. We were going to compost! We were going to re-use old containers! We were going to walk to work! Unfortunately, like a lot of resolutions, our commitment to compost, to re-use containers, and to walk slowly waned, and soon we were back to old habits. Part of our inability to follow through with our resolutions was due to our neighborhood’s current practices. There’s a lot of Styrofoam used here, a lot of double bagging those pesky plastic bags at supermarkets (our own fault, too, for forgetting to bring re-usable bags to the store). Our small recycling bin is only collected by the city every other week. There’s no outlet for recycling glass, either. So, as you can imagine, there’s a lot of waste in our surroundings. And, like other cycles, waste begets waste. But when we noticed the adverse effects of this cycle, and how easy it is to get stuck in a rut, we knew we had to begin implementing some innovative changes our wasteful ways. After accumulating an abundance of glass bottles over a 6-month period, we decided it was high time for a glass bottle painting party. We invited friends to bring their glass non-recyclables, got some acrylic paint, and created some really nice looking bottles. Now, these bottles decorate our homes as well as our desks at the office; they can be used as storage containers, as pitchers for drinks, as vases for flowers, and much more. We’ve re-used in the absence of a recycling outlet. 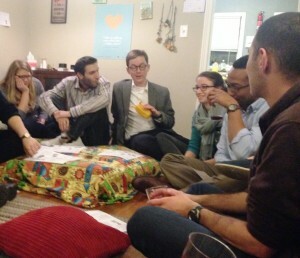 host, which means we have the opportunity to plan and create events for the young Jewish community in Jackson, with a lot of support and guidance from the folks at Moishe House. Lucky for us, the holiday of Tu Bishvat was a week away. Tu Bishvat, often called the birthday of the trees, is one of four new years mentioned in the Mishnah. We thought it would be cool to connect to the idea of the new year for trees with our drive for sustainability in Jackson. 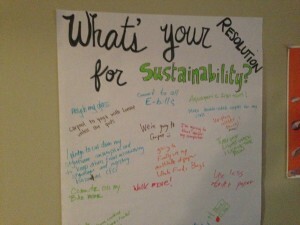 With the help of Moishe House Without Walls, we invited a bunch of folks to our house and asked everyone to share what their resolution for sustainability is. Answers ranged from “use less toilet paper” to “create a hydroponic fish tank.” We filled our house with fruits and nuts, and invited friends to try a new fruit. 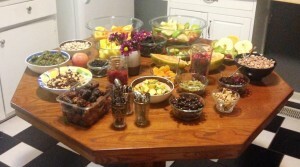 We had about 25 people in our tiny home in Jackson, trying new fruits, drinking festive Tu Bishvat wine, and working on their resolutions for sustainability. Becoming sustainable, both on a personal level and on a wider scale, is a process — and a learning opportunity for everyone involved. And on that note, we really are going to make a concrete change, after months of only talking about it. Our resolution for sustainability: we are going to start composting! Hopefully this will bring our Jackson community closer to sustainable practices, which will create a culture of sustainability, because progress begets progress. Thanks to MHWOW, we will be able to host many events in which we can chat with folks about a range of issues relevant to young Jews.